Baby places a car on top, and they're off. Zooming down the zig-zag ramps, back and forth to the bottom where music and fun sounds greet each vehicle. Two easy-to-hold cars are equipped with a roller ball to bat and spin. Spin the gas pump for musical fun. Gate closes for storage. Enhances Learning Through Discovery: Encourages baby to try different actions to make things happen, learning about problem-solving and cause and effect. Stimulating the Senses: 1) Colorful graphics and zig-zag, rolling action offer visual stimulation. 2) Lively music and fun sounds enhance auditory skills. Encourages Developing Motor Skills: 1) Enhances fine motor skills and eye-hand coordination as baby grasps and places cars or spins gas pump. 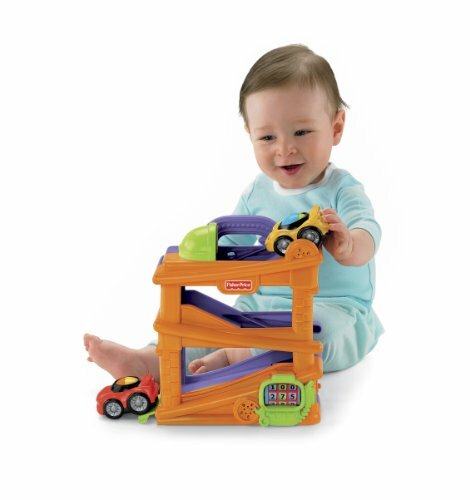 2) Fosters gross motor skills when baby crawls after cars when they roll off the ramp.Requires 2 AA batteries.